This ground lease is designed for a transaction wherein the landlord leases the tenant a site (the dirt only) for the tenant's headquarters. 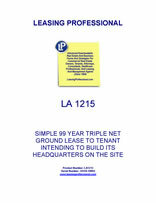 The lease is a simple triple net form, and contemplates that the tenant will build all improvements on the site. This Ground Lease is made as of _________________, by and between COMMERCIAL LANDOWNER LANDLORD, INC., a __________________ corporation ("Landlord"), and AGREEABLE TENANT, INC., a _________________ corporation ("Tenant"). 1. Leased Premises. Landlord, for valuable consideration, the receipt and sufficiency of which is hereby acknowledged, and in consideration of the rents and covenants herein provided, does hereby grant, demise and lease to Tenant, the real property situated in _________________, described in the attached Exhibit A (the "Premises"). 2. Term. The initial term of this Lease is ninety nine (99) years, commencing on _____________ (the "Commencement Date"), and expiring on ______________ unless earlier terminated pursuant to the terms of this Lease. 3. Rent. Tenant shall pay, without offset, counterclaim, or deduction of any kind, a yearly ground rent to Landlord for the Premises as provided in Exhibit C. All such ground rental is due in advance, on the first day of January of each and every year during the Term, at Landlord's address for notice contained in Section 14, or at such other address of which Landlord notifies Tenant in writing. Rent for partial Lease years will be prorated; Tenant shall pay the rent for the partial Lease year in which this Lease is executed upon signing this Lease. 4. Construction of New Improvements; Use of Premises. (a) Landlord acknowledges that Tenant intends to construct an office building (the "Building"), containing approximately _________ square feet, upon the Premises to serve as the Tenant's corporate headquarters. Tenant has developed drawings, plans and specifications for the Building (the "Plans") and has provided those to Landlord. (b) Tenant shall pay all costs to construct the Building on the Premises and all expenses associated with site preparation in connection with Tenant's use of the Premises. These costs include but are not limited to engineering fees, survey costs and permit application fees, utility connectors, driveway and minimum parking areas and landscaping. Tenant shall ensure that such construction and site preparation complies with all federal, state and local laws, orders, regulations, ordinances, building codes and zoning requirements (collectively, "Laws") applicable to the Premises and the Building. Tenant shall implement the Plans in accordance with the Laws. Tenant may construct as many improvements on the Premises as are reasonably desirable in order to operate the Building in accordance with its intended uses. (c) At its own cost, Tenant shall comply with all Laws applicable to Tenant, the Premises and the Building during its use of the Premises including the provisions of the Americans With Disabilities Act and any similar federal or _____________ Laws. (d) If Tenant constructs the Building so that any improvements installed, constructed or placed by Tenant on the Premises become affixed to or a part of the Premises, then such improvements will remain the property of Tenant and may be removed by Tenant at any time in Tenant's discretion. If Tenant removes any such property, Tenant must, at its expense, restore the Premises to repair any damage caused by the removal. Any improvements installed, constructed or placed by Tenant on the Premises that become affixed to or a part of the Premises will, upon the termination of this Lease, become the property of Landlord and may not be removed by Tenant. (iv) Pay the cost of insurance for the Premises in accordance with Section 7. (b) Landlord shall fully cooperate at Tenant's reasonable expense in contesting any taxes or pursuing any rebates, subsidies or similar items applicable to the Premises for which Tenant is responsible. But if in any lease year taxes increase substantially over the amount owed in the preceding lease year, Landlord and Tenant shall work together to contest the taxes and shall apportion the expenses of contesting and the final amount of the taxes between themselves in any manner agreeable to both. In addition, Tenant shall pay for the reasonable cost of additions or alterations made by Landlord to the Premises that are required in order to comply with applicable laws or codes, all as amended from time to time after the Commencement Date. Landlord shall invoice Tenant on a timely basis for taxes. Upon Landlord's delivery to Tenant of invoices or other documentation reasonably evidencing such costs, Tenant shall pay the amount of each such invoice within 30 days after receiving it. (ii) Tenant fails to perform any of its other obligations under this Agreement within thirty (30) days after Landlord notifies Tenant in writing of such failure (unless the failure is of a type that is not reasonably curable within a 30-day period, in which case Tenant's failure will not be deemed an Event of Default during the 30-day period and such additional time as is reasonably necessary for Tenant to effect a cure). (b) Upon the occurrence of an Event of Default, Landlord may declare a forfeiture of this Lease, and re-enter the Premises and repossess and enjoy the same as in Landlord's first and former estate. In addition, Landlord may exercise any other remedies it may have with regard to the collection of unpaid rent and any other sums due from Tenant under this Lease.